In my 1988 interview Infocom’s Dave Lebling tries to guess where computer games are headed. But was he right…? Once upon a time Infocom was just about the most famous games company on the planet. They made ‘interactive fiction’ - adventure games in which the game player moved around a huge world of linked locations (‘rooms’) breaking into buildings, taking treasures and killing monsters. In September 1988 I interviewed the co-founder of Infocom, Dave Lebling, for ‘Computer Shopper’ magazine. We talked about the history and the future of computer games. We talked about the massive resources needed to run good games (a huge 256K of memory), the languages used to program games (a variant of LISP) and pondered that most difficult of questions: would computer games one day use lots of graphics or would players be happy to carry on using text-based interaction to communicate with games with English-language commands? Well, we know the answer to that! These days the sophisticated, fast-animation of the modern generation of games has largely driven the development of ever more powerful graphics hardware. Whereas Dave Lebling was worried about the number of kilobytes required by a game, these days we discuss game requirements in gigabytes! It’s a different world. And yet the foundation for modern games was laid by people such as Lebling. Even modern games often use the same sort of plots (exploring, gathering treasures, killing enemies) as the old Infocom text adventures. But, in spite of their slick graphics, not all of them have half the wit and imagination of those early games such as Zork. If you are interested in games, game programming or simply the massive development in the processing power of desktop computers over the past few decades, I hope you enjoy this historic interview with one of computer gaming’s great innovators. See also the introduction to this interview: From Zork To Assassin’s Creed – three decades of computer gaming. When you ﬁrst wrote the mainframe version of Zork did it occur to you that you might be able to make some money out of it? So you are saying that you and Marc Blank just managed to jot it off in your free time when you were both still students? No, not exactly. There were four of us involved. Some of us were students. Some of us were not. I was a staff member, a researcher. Marc Blank was a student, Tim Anderson was a graduate student and Bruce Daniels was a graduate student — they were the other three authors of the mainframe Zork. What language was Zork written in originally? It was written in a language called Muddle (MDL - an ‘AI’ language developed at MIT). It’s like LISP - it’s a recursive structure-oriented, user extensible language. People who know LISP can look at Muddle and sort of ﬁgure out what they’re doing. If it’s so similar to LISP, why didn’t you just use LISP? Because Muddle was the language that our research group used. When we moved to Infocom we wrote another language especially for implementing Zork - that was ZIL — very much like Muddle itself but adapted specially to deal with adventure games. What’s the difference between ZIL and a more standard version of LISP such as Common LISP? The most obvious difference is that instead of having parentheses it has angle brackets. That’s the first thing that would strike a LISP user as being strange. Other than that, ZIL has in it operations for doing the kind of things that are useful in Adventure games - moving one object from one place to another and very quickly checking to see if an object has a particular property. But there’s nothing in it that couldn’t easily be implemented in a good LISP system. How has ZIL developed over the years? You’ve had several different versions as I understand it. Oh, absolutely. In the first version the actual game size was 128K and there was a maximum of 256 objects - and that includes rooms as well as treasures and so on. In ZIL the rooms and the objects are represented in the same way. But at present the maximum game size is 256K and there is, in effect no limit to the number of rooms and objects. There are other changes too. Up till now our development system has been run on a DEC System 20 but now we’re moving it onto a Mac II. The Dec 20, although we love it dearly and wish it would stay around forever, is unfortunately obsolete. It’s a huge, expensive mainframe computer. It costs a lot to maintain. It even has to have its own air conditioner. It’s really quite a drain on resources and we think the Mac should be a lot more manageable. When the games are released, what form are they in? You seem to have some kind of basic program which reads in the data. Is it interpreted in some way when we play them? Yes, it is an interpreter. ZIL itself is a virtual machine. That means it is a computer program which simulates the behaviour of a particular non-existent computer. It’s a bit like the kind of thing IBM do. They are famous for simulating earlier models of their computers. And the way you do that is to write a piece of software that acts like a CPU. Ours isn’t emulating an existing machine, it’s simulating a machine that doesn’t exist in hardware. But theoretically it could. Another similar idea is languages like Pascal which are often compiled into what’s called a p-code. We call our thing the zee-system. It was done in this way to make it easy to convert from one computer to another. Now as we move into the uncharted waters of sound and colour, it’s becoming more and more difficult to maintain that portability. Sound and colour! I thought they were an anathema to you. You’re not saying that Infocom is ﬁnally going to break with tradition and go into the sordid world of graphic adventures, are you? Yes. We’re thinking of that. After all those years when you’ve said you’d never have anything to do with graphics! What’s brought about this change of mind? When people ask me about graphics, I have never said we will never put graphics in our games. What I have said is that we will never put graphics in our games until a) they enhance the game and b) they do not detract from the amount of game available to the player. I mean, graphics eat up disk space and memory. If you put in 20 pictures, it would be unconscionable to reduce the game to half its size. So are you thinking of graphics you can look at every once in a while rather than fully animated graphics? That is close to what we are thinking of. In other words, just like Magnetic Scrolls adventures. I haven’t the slightest idea what you’re talking about! Oh well, OK, to be honest, we are very closely affiliated with Magnetic Scrolls, we like them a lot and I think they like us. I’ve heard that they have even put in quite a few references to us in their games. 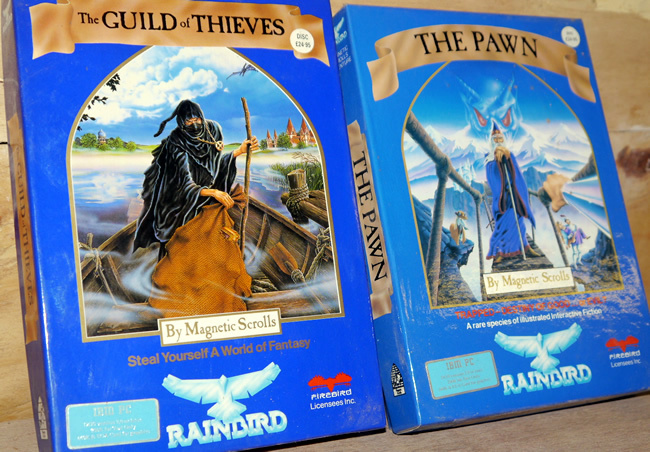 Is this an admission that you consider Magnetic Scrolls’ games like The Pawn and Guild Of Thieves to be your main competition? I would not go further than to say that we consider ourselves to be friendly rivals. Magnetic Scrolls was a British company that broke with convention by adding graphics (static images) to their adventure games and also improved the ‘parser’ to interpret more complex English-language commands. One of the things Magnetic Scrolls pride themselves on is their parser. The ‘in thing’ seems to be to allow users to type in an ever more varied range of grammatical constructions. But I wonder how many people ever get around to exploring the possible things you can say to an Infocom or a Magnetic Scrolls game? Most people end up just saying ‘Read scroll’ or ‘Kill troll’, don ’t they? So is it really worth developing parsers beyond a certain point? I think it is. It’s a controversial opinion, but I think the advantage of a better parser is that the player can say more things to the game and be understood. The disadvantage of a better parser is that the player can say many more things that will be superﬁcially understood but not actually understood. You can’t just blithely go off and say: Oh, sure, I’m going to have a parser with ellipses and questions and statements and so forth and so on. You have to do it fairly carefully. Magnetic Scrolls have done a fairly good job of extending the basic three-word parser and adding on a few more bells and whistles. And you are going to respond to that challenge, I presume. We’re certainly hoping to carry on improving our parser. Over the last few months we rewrote the parser from scratch. The games that we’ll be producing later this year will have that new parser. It will have all the capabilities of the old one plus a few new ones. Good parsers obviously need good programmers. But I gather that some of the people who write Infocom adventures are not programmers at all. Does that mean that just anybody can be given your system and a manual, put in front of a computer and start writing an adventure? Not exactly. I think a better way of saying it is that some of our writers are not professional programmers. You could not take an author off the street and just let them get on with it. You can take someone who’s technically sophisticated, like, say, Douglas Adams, with Hitchhikers. He can comprehend what’s going on, though in actuality Steve Meretzky did all the programming. Many of our writers have not previously been professional programmers so it’s not an inherently difficult system to learn. Part of the reason for moving onto the Mac is to make it more usable to non-programmers. Where do you ﬁnd new games writers? All kinds of places. Usually they approach us. The vast majority of writers have come from promotions in-house - people we knew already, who we’ve tried out on small projects. That’s basically how Steve Meretzky came in — he was a tester. Brian Moriarty was in our Systems Group - the expert on 6502 chips. Amy Briggs was another one who came in from testing. And occasionally we’ve hired people from outside. What kind of organisation is there in Infocom? You’ve talked about testers and so on. Is there a kind of elite of games writers and millions of people just testing for bugs? There’s what’s called the Software Development Group. That’s divided into three parts. One part is familiarly known as the Imps, that's the games writers, the second is the Testers. Then the third group is called the Systems Group. These are the people who maintain ZIL and various computers. I have to say that the Imps are a sort of elite. What's an average day for an Infocom programmer? Do you just come in as though it was an ordinary job and get on with your work? Or are there times when your mind is just a total blank and you can’t produce anything? What it really depends on is what stage you are in writing the games. If you are still in the design process you may well come in and scratch your head a lot. Later, once the game is largely complete, you spend a lot of time reading the scripts of testers playing the games, seeing what they tried and modifying the game appropriately. And just ﬁxing bugs. What exactly do the testers do? Do they just spot bugs or do they suggest new puzzles? They do everything from just beating on the program to see if they can break it to making, in effect, literary criticism. Everything from nit-picking about whether a particular word should have a hyphen to a deep analysis of what is going on in a program as regards the story. Well, I don’t have any difficulty coming up with ideas. If you view the spectrum of what we put out - we have sci-ﬁ, fantasy, mystery and romance - when you do a new thing you aim it at one of those points. You have an audience in mind. You want to satisfy those fans. The avid fans are always calling for more difficult puzzles. They complain if it only took two weeks to ﬁnish such and such a game. On the other hand, you don’t want to make them inaccessible to people who haven’t got so much experience at playing games. 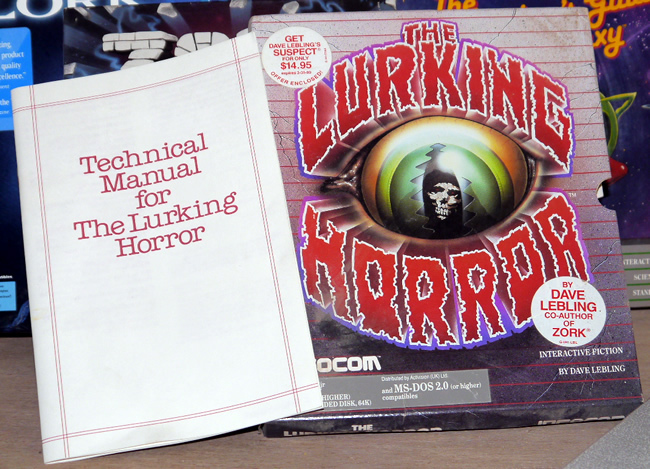 The Lurking Horror was one of the games written by Lebling. When you're stuck for ideas where do you go? Do you go to a library to ransack books, do you play other games or do you just ask one another? All of those things. For his current game, Steve Meretzky has been collecting books of logic puzzles. In general we all get ideas from books. I have a very large library. Lurking Horror was quite obviously the result of reading too much H.P Lovecraft. These days you are putting on-screen hints for people who do get stuck. Will these appear in all future releases? At the moment, that’s our plan. We’ve had mixed reaction to it. Some people love the idea, some people hate it. We may even go so far as to put on-line maps later. That’s still under consideration. We tried out the idea with Beyond Zork. But Beyond Zork shows you a fairly small section of the total map. It would be nice if you could see a bit more of it.